Explore our interactive timelines to see how FOR-A products have evolved. Flagship model in the Hanabi series. Adapts flexibly to many production environments: compatible with either HVS-2000 control panels or existing HVS-390 control panels. 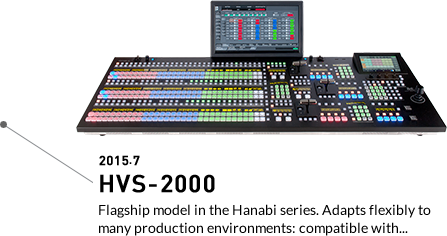 Maximum switcher performance, from convenient features including MELite™, FLEXaKEY™, P-MEM™, ONStage™, and Midas Touch™. 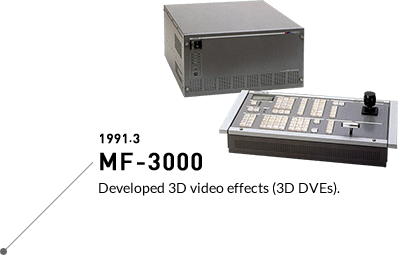 Continues to evolve to meet current needs, as shown in a newer 3 M/E expansion option (supplementing the 2 M/E launch model), 4K support, and 3D DVEs compatible with 4K 2SI. 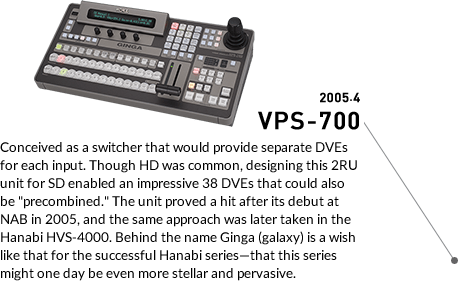 Applying expertise from the HVS-300 series, development of a new Hanabi series would raise the bar in compact switchers. 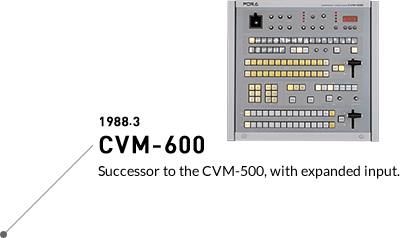 To make these models even more compact yet more capable and economical, both internal circuits and program production itself were thoroughly reviewed. 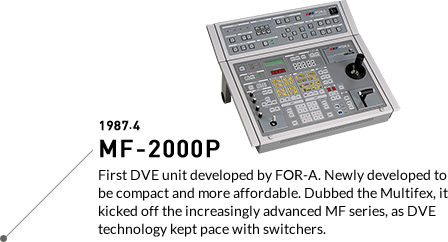 Two models were offered—one consisting of a separate main unit and control panel (as in the HVS-300 series), and the other integrating both components. Since launch, the response has been tremendous. 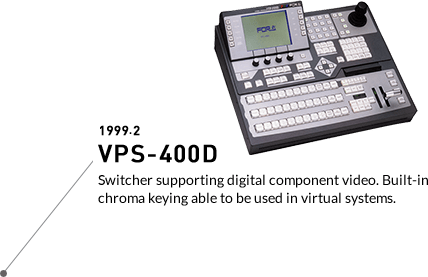 To prepare for future needs, the switchers can also be upgraded for 4K production. We invite you to see their features and performance yourself. 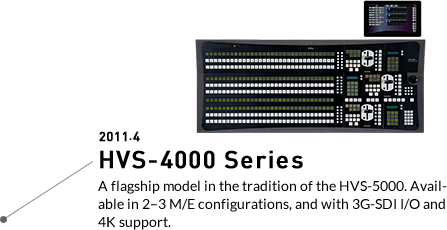 The culmination of HVS-300 series advances. Available in 1 and 2 M/E models, along with an array of control panels. Offers higher performance in many ways (such as optional storage of clips to internal memory), but the greatest advance is MELite™. DSKs and wipe/mix effects can be assigned to aux buses, enabling effects on output other than PGM. 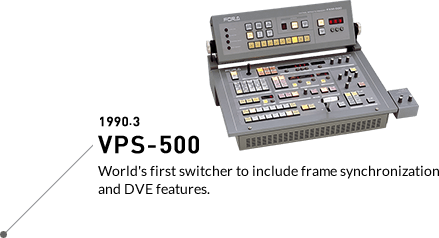 By enabling playout to large screens at live events or to monitors recaptured by cameras shooting a program, and by enabling title changes in second-screen applications, the unit simplifies presentation that were once difficult with a single switcher. 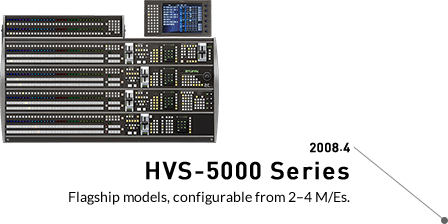 Another Hanabi milestone, the HVS-300HS represented an in-depth quest for efficiency, high performance, and affordability. 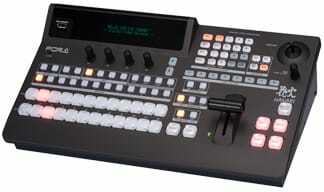 Comprehensive features included mixed HD/SD input, frame synchronization, resizing, PiP, and multi viewer functionality. Besides SDI, support for analog and computer I/O was also available. 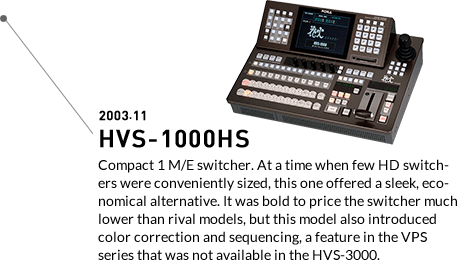 No exaggeration—the impeccable design changed people's expectations of compact switchers. Start of Hanabi switcher development, with SDI across all inputs and outputs. Switchers were able to be broadly classified by use—whether for editing or live applications—and because emerging NLE systems seemed likely to reduce demand for editing switchers, FOR-A designed the Hanabi series for live applications where switchers would remain the most effective production system. Convenient size was therefore a priority, and an ambitious goal was set: HD switchers with the world's smallest (3RU) main unit. To do so, the engineers took on the challenge of making a postcard-size SD/HD DVE board, and their success overturned conventional thinking. Behind the name Hanabi (fireworks) is respect for the explosive spread of a tradition still popular in Japan. Just as it took only a short time, historically speaking, after fireworks provided entertainment in feudal Japan until people everywhere were enjoying them, FOR-A hoped Hanabi switchers would soon rise to prominence worldwide. FOR-A entered the switcher market by introducing the world's first component switcher. Development was led by two engineers from the U.S., where demand for these video system "control centers" was especially high. The team faced several challenges: Analog component technologies were still immature, peripherals were not yet compatible, production costs were three times higher than for analog composite equipment, and no instruments were available to evaluate performance. 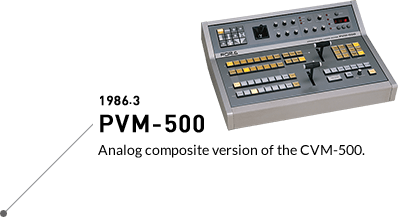 The CVM-500 took more than two years to develop, as the team cut costs, developed their own instruments, and devised ways to process component signals. Announced with much fanfare at IBC, the mixer made quite an impact.